Two factors tend to consistently influence gold and silver — interest rate expectations and mining supply. Changes in interest rate expectations typically exert a short-term, day-to-day influence that is exogenous to the metals market while mining supply has a long-term, year-to-year influence that is endogenous. Precious metals prices seem to exert little to no influence on the U.S. Federal Reserve’s (Fed) monetary policy, but changes in market expectations for Fed rates often have a strong impact on gold and silver. 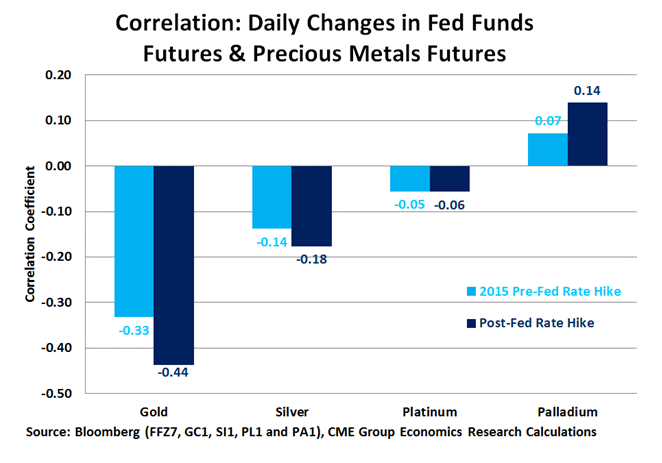 If one compares the day-to-day correlation of the changes in the Fed Fund futures rate (100 minus the Fed Fund futures price) with the changes in precious metals prices, one finds a strong and persistently negative correlation for gold and silver. Since the Fed hiked rates in December 2015, those correlations have grown stronger. Gold appears to be more sensitive to changes in interest rate policy than silver. This is probably because gold is the more truly precious of the two — it is widely used in investment and in jewelry, which can also be seen as an investment. While silver is also used in investment and in jewelry, it is more widely used in industrial and other applications. The reason why gold and silver prices react negatively to higher interest rates may be simple. The metals do not pay interest. As such, higher interest rates tend to make fiat currencies like the U.S. dollar appear more attractive to investors than gold or silver. Growing expectations earlier in the year for an interest rate hike appear to have halted the rally in the gold and silver for the time being. Gold peaked in early July, and silver in early August, but the subsequent declines have been modest. One factor that might be limiting the declines and is also one of the most overlooked is — supply. According to the GFMS Gold Survey Q2 report, gold mining supply fell by 2.2% in the second quarter of 2016 from a year earlier after having barely grown during the first quarter. The U.S. economy is doing reasonably well. Despite low productivity growth and declining corporate profit growth, the labor market appears to be strong. According to the Bureau of Labor Statistics, the total number of people working has risen by 1.9% during the past year and average hourly earnings have increased by 2.6%. All told, this equates to a 4.5% growth in total labor income. GDP growth has been stagnant perhaps mainly due to a decline in corporate profits (from very high levels), falling inventories (a good sign going forward) and deterioration in the U.S. trade balance. Inflation has been subdued in part as a result of falling energy prices but this won’t last forever, and the core rate of inflation has been perking up. As such, our view is that the Fed will gradually adjust interest rates higher, and that the boost gold and silver prices got from diminished expectations for a rate hike is mainly behind them. From our point of view, neither the interest rate picture nor mining production trends are likely to be supportive for gold and silver prices in late 2016 or in 2017. Of course, events could prove us wrong, especially if the Fed decides to further delay its next rate increase or if mining supply contracts further.